This week I attended The Disney Effect: Communicating with Autistic Children through Animation, an event hosted by the Disney Family Museum in San Francisco. Expecting the usual “parent of an autistic” author talk and autism expert lecture, I was totally unprepared for the emotional impact of Ron Suskind’s story. I had read the New York Times article and purchased the book Life, Animated so I knew going in that he would speak about the connection he made with his son through the world of Disney films. What I did not expect was just how closely his experience mirrored my own and how deeply that would affect me. After the presentation I was invited to a very small ten-person lunch meeting and, seated between Ron Suskind and his wife Cornelia, we shared stories and they were very excited about the common experiences and what we are doing at Autistry. I have often spoken and have written elsewhere about the moment I truly entered the world of my son, Ian. When Ian was very young (2 to 4 years old) he had very little language. 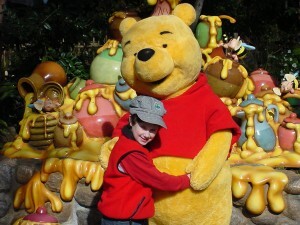 However, he could recite entire Disney movies word-for-word – especially Winnie the Pooh. During that period he also did not sleep at night, so my husband, who had to get up early for work, slept in Ian’s racecar-bed and Ian snuggled up with me. One night when Ian was happily reciting lines from The Blustery Day, I jumped in and took the part of Tigger: “The wonderful thing about tiggers, is tiggers are wonderful things. Their tops are made out of rubber. Their bottoms are made out of springs!” Ian whipped his head around, looked me right in the eye…and then burst into laughter. With a huge smile he welcomed me into his world. Ron Suskind’s experience with his son Owen was similar. Owen had been nonverbal for years until one day Ron spoke to him in the voice of Iago (the parrot in Aladdin), and Owen responded in the voice and with the words of the parrot’s master, Jafar. That moment changed their lives. Ron and his wife, Cornelia, dove into Owen’s world and together, using the characters and themes of Disney movies, helped Owen learn to read and communicate with his community. Like the Suskind’s, Dan and I embraced Ian’s world. A significant challenge for us came when Ian discovered the world of Thomas the Tank Engine. Ian knew every train, every person, and every word of every dialogue. 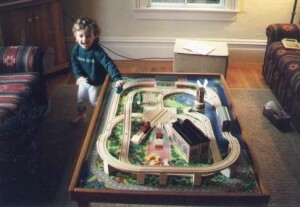 We bought him the train table and all the trains we could find. When we brought everything home and set it up, Ian was so excited he didn’t eat for three days (OK, a day and a half, but it felt like FOREVER). We became concerned and reached out for advice to therapists, behaviorists, and friends. We were told NOT to indulge this OBSESSION. We were told to put the trains away and make Ian focus on other things – age appropriate things like riding a bicycle or climbing a tree. But we looked at the joy on our son’s face, the rapture as he played out scenes from the TV series on his own Thomas track. He was not only talking, he was acting out interactions between characters. He was telling stories. Now when he went to bed, he would line up the Thomas trains on his night stand carefully so that the trains were facing each other. So they could talk to each other. So what if he wasn’t eating. So what if this looked like an obsession. My son was communicating. We have never regretted this decision. Soon he was talking more and his over-obsessive behaviors also diminished. Another shared experience was that just like the Suskind’s, we turned on the closed captions on everything on television so that Ian could read the lines that Thomas and his friends were saying. This helped Ian understand that reading was really talking. He is very good at reading aloud even when he doesn’t understand the text. Ian has developed a deep connection to storytelling. 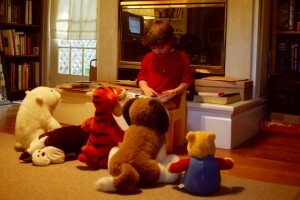 He would often create a circle with his stuffed animals and read to them. 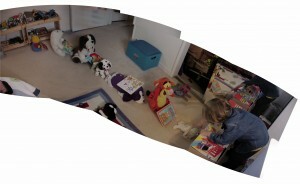 He even set up a library so that his animals could check out their own books. All this at a time when his ability to communicate verbally was still very, very low. By entering and embracing our son’s world, we allowed him to teach us other styles of communication. Connecting his imagination to the real world and to other people in his life has created a bridge between his world and ours. We use many of these techniques working with other students and families in our program at Autistry. We hope that together we can build more bridges so other families can cross over as well. This entry was posted by Janet Lawson, MFT on Monday, January 12th, 2015 at 11:40 am	and is filed under Commentary. You can follow any responses to this entry through the RSS 2.0 feed. Both comments and pings are currently closed.